The implied meaning of Ananta is the Energy in the form of Chaitanya that has no end. The date as per the Hindu lunar calendar (tithi) of Shree Ganēsh Chaturthī is Bhādrapad Shukla Chaturthi. During the period from this tithi to Ananta Chaturdashī, the energy is emitted in higher proportion from Shree Ganesh. Similarly, on this day the Shree Ganesh principle is also emitted 10% more in the Universe. The duration of Ananta vrat is fourteen years. Thereafter the vrat is concluded. 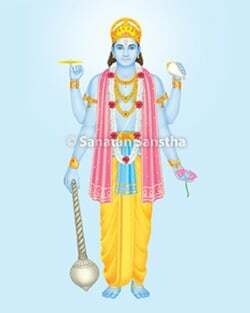 This vrat is undertaken on the advice of someone or getting the thread of Ananta easily. Click here to read more.